The ICSPOV was discontinued in October 2015. This page is intended as a reference for existing users. 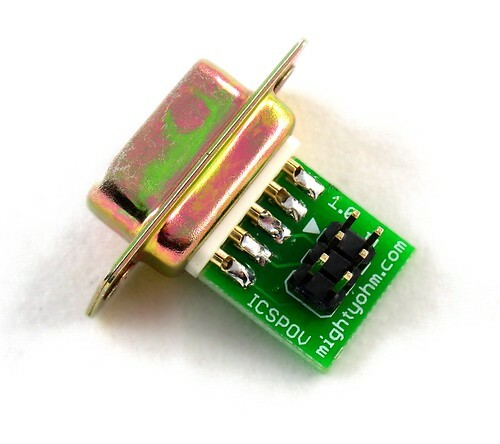 The ICSPOV is a 6-pin ICSP programmer adapter for the Adafruit Industries miniPOV3. The miniPOV3 is a great kit, but it has one big problem – if you want to change the pre-programmed message to something else, you have to use a crude programming interface called DASA, otherwise known as ‘bit-bang mode’. This wasn’t a problem back when most PCs and laptops came with serial ports, because most COM ports could handle DASA just fine. However, these days, computers don’t come with serial ports. Instead, USB-serial adapters are the most common way to add a COM port to a newer laptop or PC. DASA does not like USB-serial converters. What used to be a cheap, easy programming method is now so slow and unreliable on most USB-serial converters that it is almost unusable. What was a fun and easy kit is now much less fun when it comes time to change the displayed POV message. Programming a new message into the miniPOV can take over five minutes depending on your operating system and serial port setup. That is, if it works at all. The ICSPOV aims to solve the problem of programming the miniPOV3 by providing a way to connect a proper AVR programmer instead of using the DASA interface. The ICSPOV adapts the 9-pin serial connector on the miniPOV3 to a 6-pin ICSP header used by many other AVR projects and supported by most low-cost AVR programmers. After making one simple modification to the miniPOV3 and editing the project Makefile, an ordinary AVR programmer such as the Adafruit USBTinyISP can be used to program the miniPOV. Programming times of several minutes are reduced to seconds. The ICSPOV should work with most 6-pin AVR programmers. 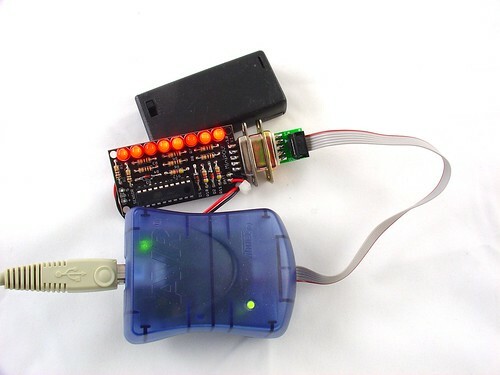 It has been tested with the Adafruit Industries USBtinyISP as well as the Atmel AVRISP mk II, as shown below. The ICSPOV is completely open source hardware. Schematics and layout files are available for download. The ICSPOV was discontinued in October 2015.